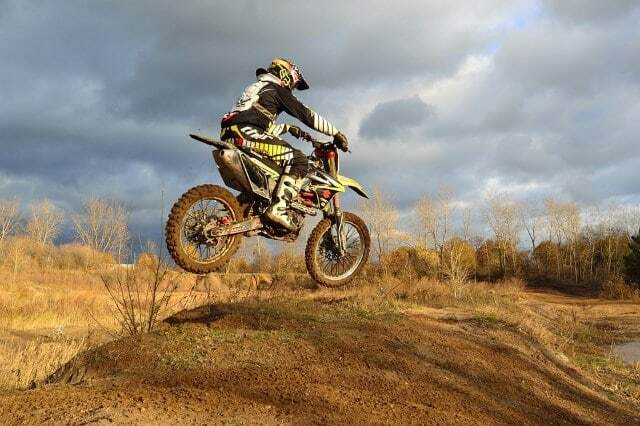 Purchasing your first dirt bike comes with a feeling of excitement that is hard to top, yet, before you take it for the first spin, it is best that you buy some appropriate motorcycling head protection. 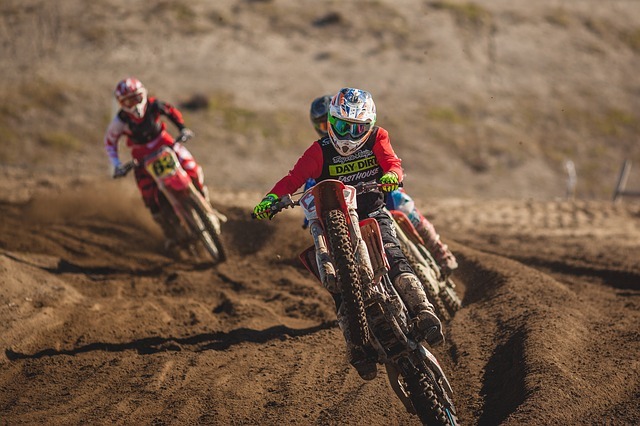 If you want to use the best gear available, be sure to check out this list of dirt bike helmets, as we are sure that you will find one that suits your needs perfectly. In this short but very informative article, we want to talk to you about how to ride a dirt bike for the first time. If you are a novice, and you want to learn more about the topic, we recommend that you keep on reading! The most important piece of gear that you should not ride without is a quality helmet. Although other safety pieces of equipment such as gloves and pads are also great to use, a helmet is vital because it is highly protective. Because falling is inevitable as a beginner, due to your lack of experience when it comes to handling such a vehicle, a helmet is a piece of gear that you should not ride without! Once you have your helmet on, the next thing that you have to do is to check your position. If you own a bike that fits your body, when you are sitting on it, your feet should be touching the ground. As a novice motorcycle rider, you will most likely be tempted to adopt a position that is way too relaxed. By this, we mean that you will tend to sit far back on the bike. Because this is not a desirable position, seasoned bikers recommend that you keep reminding yourself to move forward. By repeatedly doing so, you will eventually sit in the correct manner. The easiest way to find that right spot where you have to sit is by actually looking at the design of the ride. All dirt bikes normally feature an indentation where the gas tank and the seat meet. This is the spot where you should sit. Once you are settled in, put your feet on the pegs and try to stand without actually pulling the handlebars. If you are sitting in the correct position, this should not be an issue. However, if you happen to be too far behind, you won’t be able to do so until you slide forward. If you have mastered the art of sitting properly on your new acquisition, it is time to try it out and actually ride it. To start, you have to put the motorcycle in first gear by clicking the gear down four times. 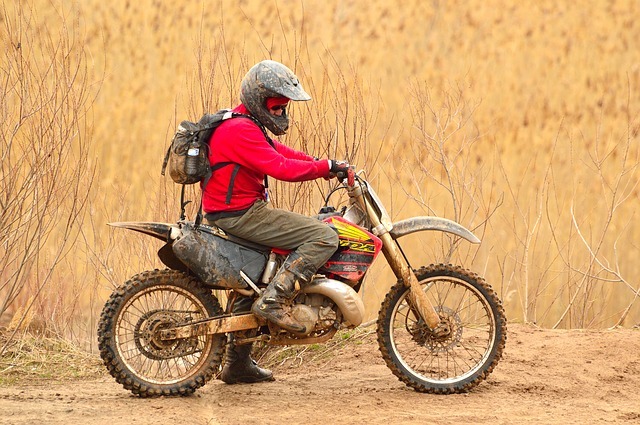 According to the specialists, for a newbie, the aim of the first ride is to get familiar with the feel of the vehicle while going over dirt and dusty hills. This feeling is completely distinct from the one you are familiar with from riding a street model. The first difference that you are prone to feel is that the ground wiggles beneath the wheels. Although it might seem disconcerting at first, you should keep in mind that this is rather normal. Plus, remember that the slower you go, the more poignant the wiggles get. To get comfortable with riding at higher speeds, it is recommendable that you train on a trail or in an open field. When doing so, try going back and forth for 15 to 20 minutes. Each time you are doing a new lap, try to gradually speed up. As the speed increases, you will stop feeling the wiggles and you will get more and more comfortable and confident. The peripheral vision is vital when riding a dirt bike. To make sure that you are sitting in a correct position that does not interfere with your ability to see what is going on behind you, there is a simple exercise that you can do. As you are riding on your beloved acquisition, try to see your front fender. If you are in the right spot, you should not have to move your head or eyes to do so. If you find it impossible to see the fender, chances are that you are sitting too close to the front part of the bike. The acceleration is another crucial thing that you should learn to control. When pushing the acceleration, you are likely going to feel as if the natural forces are driving you backward. Also, beginners that are staying too far back on the bike tend to pull on the handlebars a bit too much in an attempt to counter the force. This is a big no-no that you should avoid. When your body is correctly positioned on the motorcycle, it will tend to lean in slightly. As a result, the force of the air should not pose too much resistance. As a newbie rider, it is vital that you try to make quick and perfectly smooth shifts. By this, we mean that you have to master how to shut the throttle, pull the clutch and pick the shifter in one, continuous motion. Similarly to the acceleration, a beginner rider should learn how to utilize the brakes in an effective, safe and proper manner. When braking, you will tend to feel your body go backward, which is totally different from when accelerating. Once again, you should avoid the tendency of clutching your hands on the handlebars in an effort to counter the force that you are feeling. Even more so, if you are well seated, the breaking impact should not prove uncomfortable to you. So, your position is, once again, evidently vital. If you push the force onto the handlebars, you risk making it complicated for the bike to absorb the bumps that you are riding over. If you are positioned correctly, you will be able to feel the gas tank between your legs, and this will help you greatly to keep the right position. To practice braking, try to accelerate to 3rd or 4th gear and, consequently, brake in order to stop.